KTR is on cloud nine with TRS winning Telangana elections in grand way. He has been receiving congrats messages from all corners. Film stars including Mahesh and Ram Charan have wished him throught twitter. NTR haven’t wished KTR as he ‘belongs’ to TDP. As known, Tarak’s sister Suhasini contested in Kukatpally on behalf of TDP. NTR was supposed to campaign but he didn’t for unknown reasons. However, NTR is set to shake hands with KTR very soon. It is not political though. 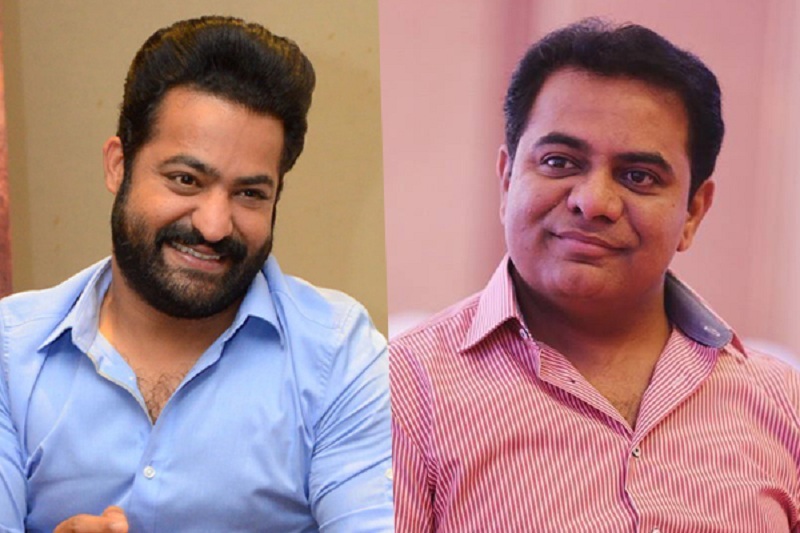 KTR and NTR are invited for Ram Charan’s Vinaya Vidheya Rama pre-release event to be held soon. KTR shares special bond with Charan. He attended Mega power star’s Dhruva event earlier. SS Rajamouli who is helming RRR with Tarak and Cherry will also be invited for the event. Vinaya Videya Rama is directed by Boyapati Sreenu and produced by DVV Danayya. Kiara Advani is the heroine of this mass action entertainer.